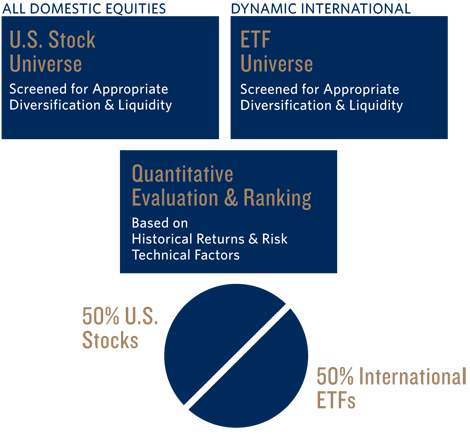 Each universe is evaluated and ranked separately, focused on identifying the most attractive U.S. Stocks and International ETFs. As investment candidates for each strategy are identified, the strategy-specific model isolates those that meet criteria and rank at the top of each universe. Global portfolio construction consists of three important steps. Bottom-up evaluation of each top-ranked investment opportunity list generated by both the international and domestic quantitative modeling and then analysis of the combined global portfolio allocations. See detailed discussions of Dynamic International and All Domestic Equity Criteria under Sections dedicated to these strategies. Approximately half of the global portfolio is held in as many as 20 International ETFs and half in as many as 10 US stocks. If a limited number of investment options meet MRM criteria, the portfolio may hold as much as 50% in cash or other defensive investments.